Komatsu distributor, McHale Plant Sales is hosting a day-long seminar for those considering an apprenticeship in the construction plant and machinery sector at its offices on Greenogue Industrial Estate, Rathcoole. To be held on a date yet to be finalised in late-September/early October, the seminar is free to participants. The programme will comprise a mixture of conference-room presentations covering all key areas of the industry, and an opportunity to view machines close-up and see the technology now being employed in their design and construction demonstrated. An introduction to the training programmes, career opportunities and salary structures that apprentices might reasonably expect will be given. 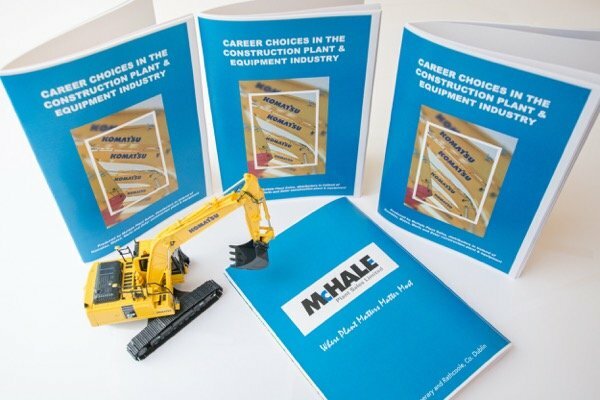 Described by Company Director, Michael McHale as a logical follow-on to its ‘Career Choices in the Construction Plant and Equipment Industry’ guide, published on the company’s website, the proposed seminar is intended as a direct response to what he says is: “A situation now developing in the heavy plant sector”. “This will see recruitment opportunities arising for those with the skills required to service the increasing use of ‘intelligent technology’ in the operation, security and work-management functions of heavy construction machinery such as excavators, dozers, graders and loaders,” he added. As an initial measure, McHale Plant Sales is now inviting expressions of interest via the Home Page on its website www.mchaleplantsales.com to be received by 31st August next. Replies will be sent to each applicant individually, including details of the programme and the advice that numbers will be limited due to conference room space and other restrictions. In that event, consideration will be given to hosting a second event at the company’s head office in Birdhill, County Tipperary.